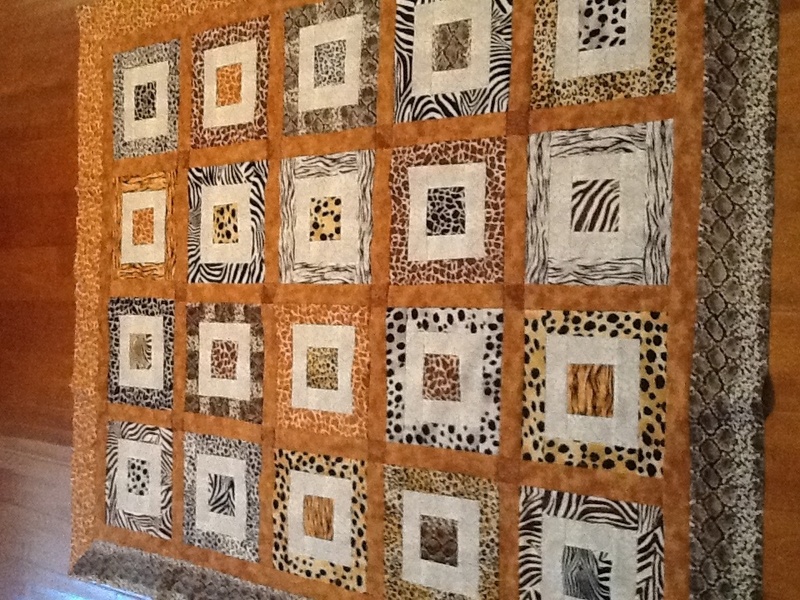 This is my wild animal quilt top in the works the pattern shows the border that is split one half giraffe and the other half is the snake skin, should in do as the pattern or make it all the same of either pattern and if so which pattern? I think I would like about a half inch black border around the main part and then the gold border. The snakeskin puts more contrast against the sashing. Snake skin all the way! It looks like a giant snake circling the quilt. I like the snakeskin best. 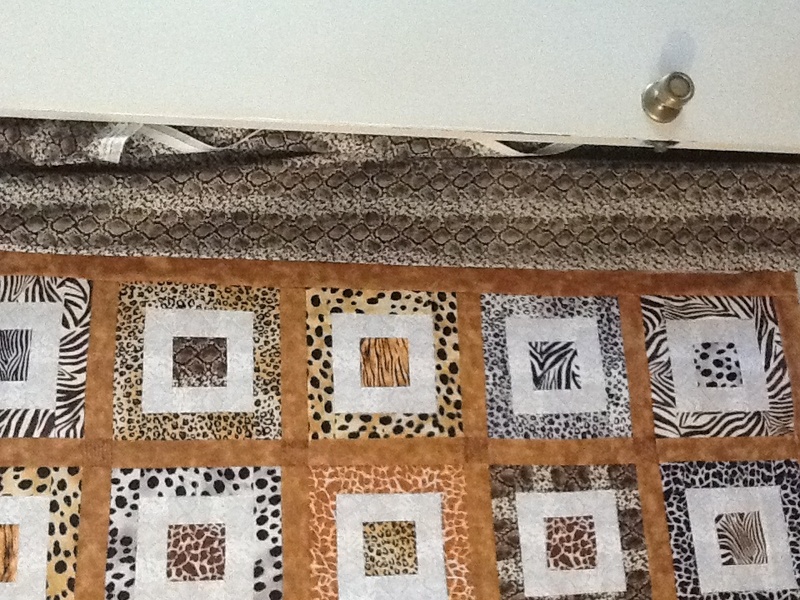 It has more contrast with the sashing and sets off the main part of the quilt better. I think the giraffe print is in keeping with the other mammal prints. The snake is a reptile print. If you are working a theme here I would stay with the furry animal prints and not the reptile print. A very nice quilt you have there. EDIT: I like bears idea of going with a narrow black border and then the giraffe. Very nice. the black and white snakeskin does look the best but man, do I hate snakes! Don't you have enough of the black/white animal prints you could use instead? They both look great. The snakeskin makes it go into the cool colour range and the giraffe into the the warm colour range. Go with which you like best or both. It turned out very nice!! I definitely like the second one best. Ohhhh, Attic Window effect....I LIKE it! 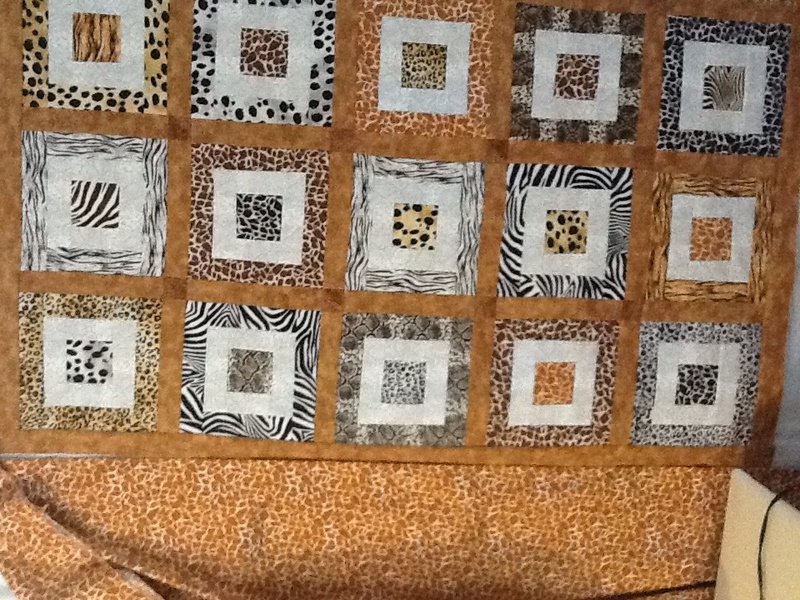 The snake print overpowers the blocks in the quilt and takes away from the overall beauty of the quilt. I vote for the giraffe. Nice quilt by the way. Your choice adds so much interest to a beautful quilt. Well done! I like the gold border but put a small border of black maybe a faux border before the gold and snake binding. I would opt for the snake too but the idea of a thin black band and then the giraffe sounds good too. Would love to see it when it's finished. I so love animal prints.